Rosemarie Arnold was born on June 9, 1962 to Iris Arnold, a school teacher, and Dr. Murray Arnold, an obstetrician gynecologist. Her dad passed away when she was 5 years old, leaving her mother to raise their 6 children in Washington Heights, New York. She graduated with honors from the Bronx High School of Science in 1979, where she was the captain of the women's swim team. In 1983, at age 20, Arnold graduated from The State University of New York at Binghamton, then headed to Brooklyn Law School where she was a member of the Moot Court Honor Society and captain of the negotiating team. After graduating from law school in 1986, Arnold began her career at the Law Offices of Christian Stueben, where she represented predominantly large corporate defendants, such as Foodtown, Pathmark, Stop & Shop, Campbell's Soup Company, Arcola Bus Company, Bally’s Total Fitness, T.G.I. Fridays, Libby’s Foods and Cigna Insurance Company. In 1989, feeling unfulfilled with defense litigation, Arnold founded The Law Offices Rosemarie Arnold, (a firm devoted to the representation of injured victims), in a one room office in Englewood Cliffs, New Jersey which she shared with her paralegal Mary Mazza. Twenty five years later, Arnold has built her law firm into one of the largest and most successful plaintiffs firms in Bergen County where Mary Mazza serves as the CFO. Between 1989 and the present, Arnold has recovered hundreds of millions of dollars in settlements and judgments for her grateful clients and succeeded in scores of high profile cases. Arnold has been called upon to give her legal expertise to the NY Times, Daily News, New York Post and Wall Street Journal. She has also appeared as a legal expert on Good Morning America, the Today Show, The Early Show, Maury Povich, NY1, ABC, NBC, CBS and FOX News, Inside Edition, and Extra TV. Notably in 2013, Arnold was named EXTRA TV’s legal correspondent. State of New Jersey Senate & General Assembly Citation honoring “Ordinary mothers who do extraordinary things to serve our community”. Arnold has been a staple on the New Jersey Super Lawyers list every year since it's inception in 2005. In 2011, Arnold opened a personal injury boutique in New York City. Less than 2 years later, she was named to the New York Super Lawyers list as well. Arnold is one of a handful of lawyers named to both the New Jersey and New York Super Lawyers lists. Arnold is admitted to the bars of New Jersey, New York and Nevada. She is also admitted to the United States District Court of New Jersey, the United States Eastern District Court of New York and the United States Southern District of New York. 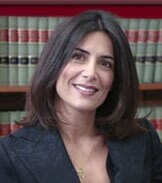 In 1995 Arnold was certified by the Supreme Court of New Jersey as a Certified Civil Trial Attorney, at the time, she was the youngest attorney ever certified in NJ. She has been re-certified to present day. Arnold is a member of the Multimillion Dollar Advocates Club, Morris Pashman Inn of Court, Bergen County Bar Association, New Jersey Bar Association, New York Bar Association, Nevada Bar Association and the American Association for Justice. Arnold sits on the Board of Trustees of the Rebeka Verea Foundation, a non-profit corporation founded in the memory of a 17 year old client of Arnold’s who was killed on the night of her high school graduation, while a passenger in a speeding car. Arnold is an active member of the Foundation, traveling with it’s founders to high schools in New Jersey giving presentations on the dangers of speeding and drunk driving to teenagers. Arnold also sits on the Board of Trustees of the Leonard Melfi Foundation. Arnold also sits on the Board of Education of Saddle River, a position she was elected to in 2006. Arnold has been profiled in several periodicals including New Jersey Super Lawyers, Social Life Magazine, The Bergen Record and The Town Journal. Arnold has made recent headlines for her extraordinary results on behalf of sexual abuse victims.